Each of us crave for a sweet and lovely home but not all can afford it. The real estate prices have skyrocketed and have gone pass over the common man’s capacity to own a dream home. As per a technical study conducted in 2011, the housing shortage in urban areas of the country is around 18.76 million, of which 96% is in the EWS segment and in LIG Housing segment. The thrust of the Mission has been to make available housing for the Economically Weaker Sections (EWS), Lower Income Groups (LIG) and also the MIG (Middle Income Group), by harnessing Government land. Sandeep Sharma takes a look at the innovative solutions to solve housing problems in India. Apart from the high prices there are hundreds of other impediments in the path of addressing the burgeoning housing shortage in India. Some of these include lack of finances, finance available at high interest rate, little transparency in the housing sector, broken promises by the builders and illegal construction. RERA (Real Estate Regulation & Development Act) has addressed many of these concerns and tried to provide a transparent mechanism making the builder accountable for the project execution, construction quality and time bound completion of the project. Real estate sector in India was largely unregulated. The sector has grown significantly in recent years but marked with issues like lack of transparency, absence of professionalism and standardization, and lack of adequate consumer protection. The buyer was generally at the mercy of the builder and accountability often found to be missing. The Real Estate (Regulation and Development) Act, 2016 (RERA) finally gave India’s real estate sector its first regulator on May 1, 2016. RERA is aimed at establishing real estate regulatory authority for regulating and promotion of the real estate sector, ensuring efficient and transparent transactions and establishing an adjudicating mechanism for speedy dispute redressal thereby protecting the interests of consumers. It seeks to address vital issues of fair transactions, timely delivery and quality construction. To boost fund flow from foreign sources for the real estate projects, the Government of India has liberalized FDI in construction development, thus significantly reducing minimum area and capital investment requirements for foreign real estate developers. According to World Investment Report of UNCTAD, FDI in real estate touched $5.7 billion in 2016. According to Department of Industrial Policy and Promotion (DIPP), the total FDI investments in India during April-September 2017 stood at US$ 33.75 billion, indicating that government's effort to improve ease of doing business and relaxation in FDI norms is yielding results. In the Construction development segment comprising Township, Housing, Built-up Infrastructure, FDI of Rs 2,338 crore was received during April to September, 2017. The Government of India is gearing up to build ‘100 Smart Cities’ and spruce up urban infrastructure under key reform program such as ‘Atal Mission of Rejuvenation & Urban Transformation’ (AMRUT). With this the real estate or the housing sector is likely to get a boost and immediate attention from all the stakeholders. The Centre is keen on providing housing to each citizen and as part of its urban reforms agenda has launched ‘Housing for All by 2022‘ mission. The mission focuses on building 3 crore new low cost and affordable homes. The Government has accorded infrastructure status to affordable housing, providing tax incentives for buyers and builders of affordable housing and credit linked interest subsidy under Pradhan Mantri Awas Yojana (PMAY) to home seekers. The Public Private Partnership Models for Affordable Housing has been initiated in order to meet the challenges identified and give fillip to the scheme objectives. As per figures released by Ministry of Housing & Urban Affairs in November, around 30.76 Lakh Houses have been sanctioned so far under PMAY (U), 15.65 lakh houses are at various stages of construction and 4.13 lakh houses are constructed so far since the mission was launched. Despite so many announcements, policy changes and reforms, still it’s a long way to go towards fulfilling the aspirations of billion Indians in having their own home. There is a need to come out with innovative and technology based housing solutions which can help in undertaking construction of affordable houses at a gigantic scale. KEF Infra, a division of KEF Holdings a multinational diversified Group with operations in strategic investments, infrastructure manufacturing, and healthcare development, across India, UAE and Singapore has developed one such solution to solve India’s growing mass housing issue. KEF Infra has the largest offsite manufacturing unit for prefabricated concrete buildings. Offsite manufacturing refers to building structures in a controlled factory environment where around 80% of the building components can be manufactured away from the physical site. The entire building components such as columns, beams, hollow core slabs, wall panels, staircases, windows, doors, bathroom units and facades are manufactured in factories, in a controlled setting before they are installed at the physical site. Offsite manufacturing can ensure time savings of up to 50% and cost savings of up to 30%. These savings come from the reduced need for preparatory work onsite, opportunities for clients to make quicker rental returns and reduced interest payments for investors. According to Faizal, the technology used in producing pre-fabricated structure is quite environment friendly and generates just 2 percent of wastage in comparison to 12 percent waste in building construction using conventional route. Using the prefabricated route, the company is able to produce Smart Home as displayed in the picture for a common man at a cost of just Rs 7 lakh. The size of the home is 384 sq. ft. and it is a two-bedroom home which can be assembled in 2 hours. The cost is Rs. 700,000 for a fully furnished house which includes all internal furniture like beds/sofa/dining table all made at the joinery at our factory KEF Infra One. It is concrete structure home joint with mechanical connections. When asked to Faizal whether there is a scope for further reduction, he replied in the affirmative considering the economies of scale. 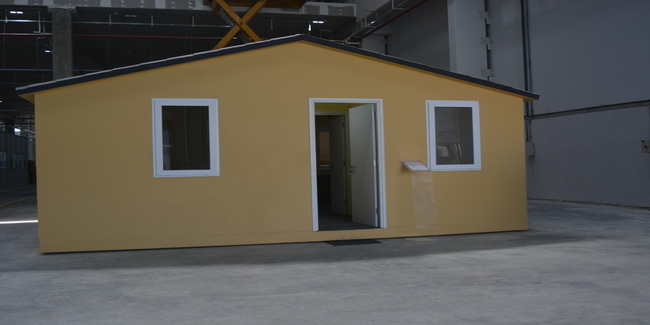 The production of prefabricated homes is scalable to a large extent and can be a solution to growing housing shortage in the country. The turnaround time in the production of housing units can be reduced and mass housing construction can be taken up in minimum time frame. The need of the hour is to promote more such ventures in India and provide certain incentives for projects using prefabricated structures. This way the existing builders / developers can also take advantage of the modern technology and offer prefabricated houses, thereby reducing the turnaround time in delivering houses. Faizal claims that the technology is quite reliable and sustainable in the long term. One can see the proof of sustainable prefabricated technology solutions provided by KEF Infra to its clients like Sands Infra, Malabar Gold, Brigade, Mahindra, Bhartiya City, Leela and At One amongst others. The solutions delivered included several specialised projects in Bathroom Pods, MEP, Joinery and Aluminium and Glazing. The Krishnagiri factory of KEF Infra in the state of Tamil Nadu has specialised individual factory units for these with world-class technology and KEF Infra is expanding its offering to hotels, retail stores and other commercial units through these new offerings. The company plans to come up with off-site manufacturing facilities in Lucknow, Andhra Pradesh, as well as Maharashtra. KEF Infra has an aggressive growth plan and the company is targeting revenues of USD 1 Billion by 2020. India needs mass housing solutions which are sustainable, economical and takes less time. Prefabricated concrete structures are one such solution. We need to find hundreds of other innovative ways to address the growing housing problem across the country. India needs more such entrepreneur like Faizal who can come forward and strive to create innovative solutions which can transform the lives of many.